Hello fashionistas, I’m excited to be sharing my experience with @teamiblends with you all! As I get older, it’s important to eat healthily but sometimes it can be hard to stay on track, so I was happy to become a #teamiparner. I’ve used @teamiblends 30-day detox for over 3 weeks and it’s been an On-trend help with any stomach issues on the go. Like most women, I can get so horribly bloated when traveling and it’s really uncomfortable especially being away from home. Since starting this, I feel like a new woman and much lighter too! If you’re wondering about Teami, I personally recommend it to everyone! Use my code TREND50 and save $10 off your order. I spent the last few weeks watching all the couture spring and summer designer shows as well as the new collections ready to hit the market. This allowed me to let you know what’s coming! The hot trends that are all over the catwalk, and designer fashion shows for spring summer 2019. Not all new trends will be for everyone. Personal style should always come first and if a new trend intrigues you and you think its something that can work with your own personal style then have some fun and try a few new things! I will list the fashion, color, fabric, pattern, accent, accessories, and shoe trends that are new for this coming spring and summer. I will also discuss some previous trends that are going to stay current as we move forward. The asymmetrical design was the most prevalent design trend I saw almost every designer showing in their new collections. Off the shoulder styles still going strong with one shoulder asymmetrical looks leading the way. Pantsuits, jumpsuits, boilersuits, are all on-trend. Midi, and maxi length skirts and dresses, padded and big shoulder details that recon to the 1980s is back in style. Ruffles large and small were a huge trend. Longer length’s for shorts just above or below the knee. Chanel showed biker shorts worn with heels and blazers. Structured jackets with flowy pants or skirts, and lots of oversized blazers. The cape or garment with cape-like detailing in the back. As for pants, anything and everything goes; from skinny to wide leg, bell bottom, and high waisted styles still very on-trend. So whatever pant or slack looks best on you will be on-trend! Black and white are very popular as are soft neutrals beige, tan, sand, and brown tones. On the brighter side of things, yellows of all shades from pale to mustard or marigold tones. Pinks, pale pinks to magentas and fuschias, and lavender. Baby blue, royal blue, and navy, also all shades of green. on the brighter side, orange was a standout and red was still going strong into spring. Last of all bold neon colors were a very popular trend for the new season ahead. Lots of silky, and sheer flowy fabrics. Anything shiny, sparkly or iridescent, and metallics are still very on-trend. Lace, exceptionally large almost Battenburg and cutout looking laces. Netting type textures, as well as crochet, were very prevalent. Bleached denim made a big splash on the runway as well as leathers of all types are still very on-trend. Then clear plastic made its way into coats, handbag, and shoes. Florals large and small were everywhere on evening gowns to blouses and even pants. Coats, shoes, and boots were all adorned with florals. Polka dots made a huge splash! And the animal print trend is not going away anytime soon with leopard, zebra, snakeskin still very on-trend in the season ahead. Stripes, plaids, still on trend while and tie-dye also made an appearance. Color block and pattern mixing was also a prevalent styling trend. Lots of sequins, beading, or anything that had sparkle, fringe of all types (including leather and beads strung to look like fringe), and feathers were everywhere. Also, lace showed up as trim detailing on everything from dresses, skirts, and even pants. Pleats and rushing also in style. The Bow was a very popular accent used. Last of all the butterfly and fabric rose detail was a new surprise. I’m sure we will be seeing these two trends make their way to retail. The belt made the biggest splash in accessories. Big belts, small belts, chain and jewelry like belts, belts with large gold buckles, belts that hung long and had movement when walking, rope styled belts, and belts worn with other belts (two or more worn together). Everything was belted. Evening gowns had belts, belts over the top of blazers, belts over long tunic tops, pretty much anything you could add a belt to had a belt. Also, the belt bag was also a huge trend. So I would say any belt you have tucked away in your closet will be on-trend this coming season. The large brim hat was a popular item. My favorite accessory trend was the statement earring and statement necklace! Big bold jewelry was a huge trend, and even fancier styles were worn with more casual looks. As for shoes, the ankle bootie is still here to stay as well as the knee boot. The pointy toe pump took a twist with the addition of a T strap or ankle strap detail. The strappy sandals are still trendy. The wedge style shoe or sandal is also making a big splash on the runway. Finally, large handbags seemed to be the most popular, most designers showed very large handbags with their collections. I know this is a lot to take in, but I just wanted you to know just what trends were available for you to choose from. I think the styling trend that was most wearable for everyone no matter their age or body type was the monochromatic look. This look of wearing one color from head to toe is universally flattering on everyone! It is also a very classy look that can make whatever you are wearing, look more expensive than it is. What trends will you be incorporating into your spring summer looks? I know I will be loving and wearing several trends as we enter into spring. NEWA Skin Rejuvenation The Best Gift For Valentine’s Day! If I didn’t already have one I would gift it to myself! I am so very excited to be able to share with you all a discount code to save $160.00 off on a NEWA beauty tool. I absolutely love this device! It made turning 60 this December a piece of cake. I use mine at least 4 times a week on my forehead, cheeks, lower jaw, and chin, and even on my neck. The NEWA sends radiofrequency energy deep into the dermis layer of the skin, and this energy heats up the dermis to the point where it stimulates the production of new collagen. This, in turn, reduces wrinkles and fine lines, lifts and tightens the skin, reduces enlarged pores, evens out your complexion, contours your cheekbones and jawline, and gives you an amazing glow. It’s everything you want and more! All of the stars in Hollywood are using the NEWA! This is one of the things they do to stay looking so good! Just use code ONTREND50 when you check out at www.trynewa.com and you will save an amazing $160.00 off your purchase. Thank you NEWA for letting me give this great offer to all my subscribers and followers! The question that I hear the most is also the complement I receive most often; “how do I always look so put together and classy?” LOL…..If any of you knew me in everyday life you would know that I am a very relaxed and open person and unashamed to tell almost anything about shortcomings. So the statement that I look classy can make me giggle a little bit. Because I don’t think of myself that way! I’m a pretty silly gal, to say the least! I have five key things I do when getting dressed every day that make for a put together classy look, no matter how casual the outfit is. So I will share them with you. Let me start by saying some of the things I will share with you some women my age will disagree. I can only share what works for me and provide my thoughts as honestly as I can. So let’s get started! #1 Accessories; at 60 years old no matter what I’m going to wear I always add a few accessories. In my opinion, you don’t have an outfit without them, it’s like a cake without the frosting. For example, I will at least add some earrings, a watch or bracelets, and a belt. Or, possibly a scarf, earrings, and a bracelet. Now you have some frosting! I always try to add at least three accessories. I think this comes from my Interior design background rule of 3-5-7. I like to stay away from even numbers, as uneven numbers are always more ascetically pleasing to the eye. For example, you should not put two candles on the table. Instead, you should use an odd number, and either have one candle or three candles. #2 Shoes; this is a difficult subject as we age because of foot problems etc. so comfort is key. However, some comfortable shoes are not very attractive and they can kill the whole look of your outfit. If you have issues wearing heels I do understand because when I was first diagnosed with MS at the end of 2012, I had to stop wearing heels for a few years until my health got better. So, it was a challenge to find comfortable flat and lower heel shoes that I wouldn’t trip in. But, if you put some effort into finding attractive shoes, it will take your look from frumpy to classy. 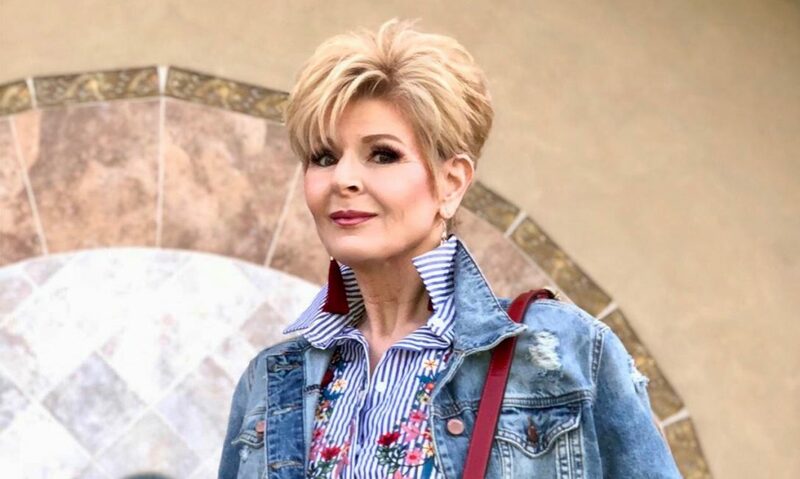 I will often see older women dressed nicely with accessories, with their hair and makeup was done with big joggers on or orthopedic looking shoes, and it hurts the whole look. In some cases looking like an old bag lady. I know this sounds brutal and harsh, but it’s important to invest in attractive, comfortable shoes. Many companies now make shoes for the mature woman who especially need comfort. I will make recommendations below of some shoes with a high comfort level and great style as well. Try a comfortable kitten heel or wedge bootie to wear with your pants. Even a pretty loafer. Try arch support added to a stylish flat. I always stay away from a jogger when going out. I keep them for wearing at home and going for a walk or hike. I know it’s an on-trend look right now to wear a jogger with dresses, but I say this is better left to the younger ladies! I personally have never seen this look pulled off well by mature women. I always think an attractive shoe looks on point! I will link some comfy shoe brands below. #3 Layers; add a third piece. A jean and T-shirt or top is only that, its not an outfit! When you add a sweater, jacket, or even a scarf, now you have an outfit! By adding a lightweight sweater over your shoulders, or just putting a cami under a collared shirt you now look like you are wearing a well thought out outfit. The more layers you incorporate, the more put together you will look. Now I know in the heat of the summer this might not be practical so remember to accessorize! Simply adding a belt can kick things up a notch. #4 Hair; this is another touchy subject with mature women! My preference for most older women is shorter hairstyles above the shoulder. I do know a few gorgeous women that look amazing with long hair! However, they have the right shape face for it and even more important, they have thick, healthy, and styled hair! If you have dry, thin, and damaged hair, it can make you look older than you are. As we age, we need softness around our face. We could also use some height on the top of our head to give a lift to our face. Everything we do needs to be lifting our face, not pulling it down as gravity is trying to do that already! If you have been wearing your hair the same way since high school, and you’re now over 50, its time for a change even if its small. Figure out what shape face you have and then pick a style that flatters your face. Then style your hair! This will give you a modern, current, more polished look in the end! #5 Makeup; try some makeup! You don’t all have to wear as much as I like to wear. I understand we all have our individual style! And if you have been a natural kind of girl in your younger years, I understand. However, as we age our complexion changes. It greys and can tend to look sallow, and we often get age spots. If all you do is wear a tinted BB cream, a touch of blush on your cheeks and some lip gloss, you will always look more polished and put together. If you saw two photos of me wearing the same outfit, the first showing my hair and makeup done, and the other without my hair and makeup done you would see what a difference it makes! I truly believe putting on some makeup and styling your hair is 50% of the overall look of your outfit! If you have never worn any makeup take a trip to a Lancome or Este Lauder makeup counter at a department store, or go to a Sephora and ask for a free makeover! Just ask for someone who understands how to do makeup for mature skin. So there you have it! These are the five things I do that I know help me look like I’m sophisticated and classy even when I’m really not! These tips also help me feel more confident about how I look, and that translates into being more confident! I hope this has helped some of you. I will add a bonus tip, and that is to make sure you smile! A smile is the best finishing touch to any outfit and makes everyone beautiful.